Los Angeles, California – May 21, 2010 – Environmentally-conscious DiMora Enterprises, LLC will showcase their elite one-off custom motorcycles during the Green New Life Expo, May 28-30, at the Proud Bird Convention Hall in Los Angeles, California. "The Expo's creators wanted to demonstrate that in almost every aspect of our daily lives, we can all make choices that will help preserve the long-term viability of Planet Earth," noted Expo Manager Adam Appolito. "We were delighted to find a motorcycle manufacturer who brings that idea to life in the bikes he builds and his support of this Expo." "We felt it was important to sponsor this event because the environment affects us all," said Sir Alfred J. DiMora, founder of DiMora Custom Bikes. "Not only do our motorcycles have that cutting-edge look and ride like a dream, but they also provide eco-friendly transportation by giving off far less emissions than most vehicles on the road today." Three motorcycles will be on display from DiMora Custom Bikes: the Knight Moves Series 180 classic pro street springer, the Dragon's Breath Series 250 upper range softail chopper, and the luxurious ZTango Series 300 easy rider softail chopper. DiMora will also be providing early information about his hybrid gasoline/electric motorcycle that is expected to go 120 miles on a single gallon of gas. Uniting under the theme of "Illuminating the Path to Greener Solutions", the Expo's speakers and exhibitors will show how to grow the economy and enrich individual lifestyles in ways that are healthy and preserve the environment. 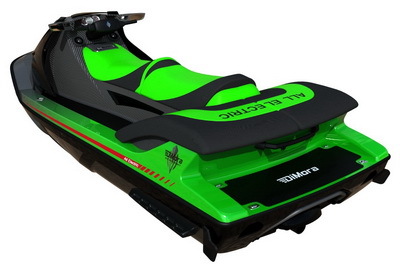 In support of that theme, Alfred DiMora will discuss plans for the electric jet-ski now under development at DiMora Eco Watercraft. With a hull engineered from lava rock, zero exhaust emissions, and ultra quiet operation, the Stealth jet-ski will be in a class by itself, a signature trait of all products from DiMora Enterprises. Scores of celebrities will participate in the Expo, including Debbie Reynolds, Peter Marshall, Trini Lopez, Shirley Jones and Marty Ingels, Maud Adams and other Bond Girls from the 007 movies, cast members of the Police Academy movies, actress and Hollywood executive Terry Moore, Carol Lynley, and many more. For more information and tickets for the Expo, please visit www.greennewlifeexpo.com. Based in Palm Springs, California, the DiMora Enterprises, LLC family of companies excels in creating distinctive limited-edition transportation solutions. DiMora Custom Bikes takes the passion for technological innovation and uncompromising quality that is the hallmark of the Natalia SLS 2—the $2 million V16, 1200-HP sport luxury sedan currently in development under the DiMora Motorcar label—and brings it to motorcycles that are available worldwide through the growing DiMora dealer network. Founder and CEO Sir Alfred J. DiMora’s biking innovations began in 1978, when he created the breakthrough unibody motorcycle design. His automotive work also began in the 1970s, when he co-founded Sceptre Motorcar and later went on to own Clenet Coachworks, where he designed and built Clenet luxury cars. When President Reagan declared 1986 the Centennial Year of the Gasoline-Powered Automobile, the Clenet was selected as the Official Centennial Car, resulting in honors for DiMora and the Clenet at the Automotive Hall of Fame in Michigan. Please visit www.dimoracustombikes.com or www.dimoramotorcar.com.